Melania Trump always knows how to dress for the occasion -- and her outfit to watch the solar eclipse proved just that. The first lady observed the solar eclipse from the White House balcony on Monday wear a black form-fitting sheath dress with pleated detailing on the bottom. The stylish LBD also featured criss-cross striped detailing on the bodice. While the dress didn't pair well with her eye-protecting eclipse glasses, Melania looked stunning nonetheless. In later photographs, it looks like Melania traded in her eclipse glasses for the stylish pair of tortoiseshell sunnies she was wearing the day before. Meanwhile, first daughter Ivanka opted for a bright red dress that hit just above her knees. The work-appropriate ensemble featured black accents throughout that matched perfectly with her pointy black pumps. She styled her blonde tresses in a fancy ponytail and kept her makeup to a minimum for a fuss-free look. The first daughter documented her family's eclipse-watching experience on Instagram, and it looks like they had a total blast! 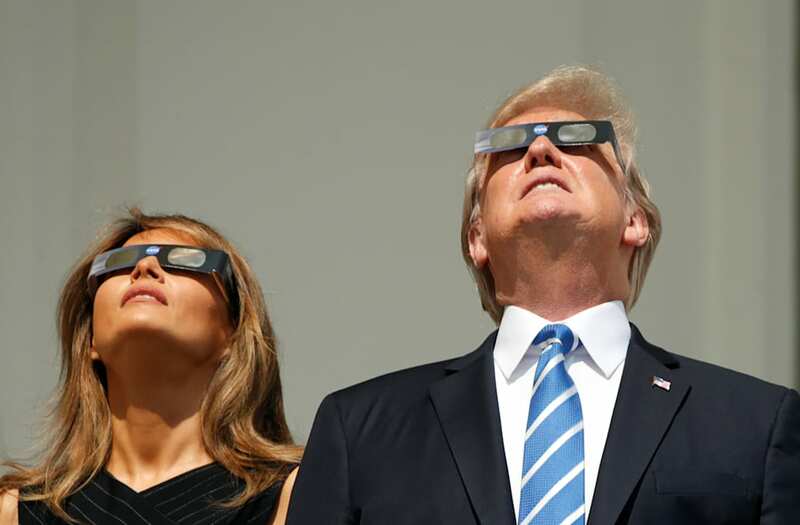 At one point, President Trump worried onlookers as he looked straight into the sun without his eclipse glasses on. Melania has remained out of the spotlight for nearly a month, worrying fans about her whereabouts. She emerged from hiding on Sunday night after last being seen at an Ohio rally in late July. Of course, she dazzled in yellow and white sundress from Spanish brand Delpozo. Check out the slideshow above for photos of the first family watching the eclipse!